Gorgeous Boat For The Watersports Family, Triple Pontoon, Black Wake Tower, Wake Rack, Wake Speakers, S/S Ski Pylon, S/S Boarding Ladder, V-Max 200Hp SHO Yamaha 4 Stroke Outboard, 5 Blade S/S Tow Prop, Tilt Hydraulic Steering, Large Capacity Fuel Tank For That Full Day On The Water, 27 Inch Center Tube with 25" Outside For Superior Handling/Cornering, Infinity High Performance Sound With Amp/Sub/Tower Speakers, Dual Battery's, Privacy Curtain/Change Room, Bimini Top/Playpen Cover, Reclining Commander Chairs For Him & Her, Black Powder Coat Pkg, Does Not Get Any Nicer Than This! 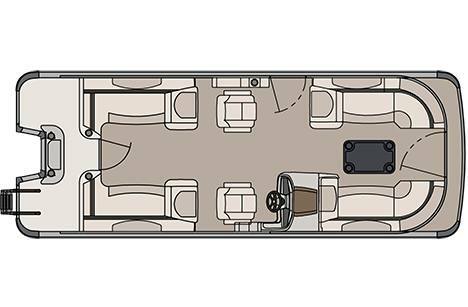 Includes Tandem Trailer 5Yr Warranty Stem to Stern Including The Motor, Financing Rates As Low As 4.64% Monthly Payments From $520 Per Month! OAC Call For Details. Find the sun from any angle on the Cascade Quad Lounge. Our most affordable version of the Quad Lounge floor plan. Find the sun from any angle on the comfortable fore and aft facing lounge arms on our Cascade Quad Lounge. The unique co‐pilot seat provides 360° viewing for Skiing or tubing behind the high speed capable triple pontoons. Then when it's time to stop and swim enjoy the large rear swim platform with two easy access ladders. Max. Weight Cap. : 2150 lb. Max. People Lbs. : 1540 lb.